How to watch Teen Titans Go! : Season 2: And the Award for Sound Design Goes to Rob / Some of Their Parts on Netflix Egypt! Yes, Teen Titans Go! : Season 2: And the Award for Sound Design Goes to Rob / Some of Their Parts is now available on Egyptian Netflix. It arrived for online streaming on June 21, 2018. We'll keep checking Netflix Egypt for Teen Titans Go! : Season 2: And the Award for Sound Design Goes to Rob / Some of Their Parts, and this page will be updated with any changes. 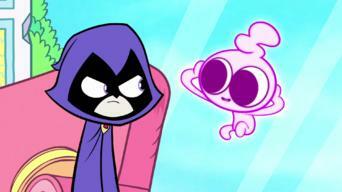 Raven gets more than she bargained for when she wishes for peace and quiet; Robin uses Raven's prism to split each Titan into different emoticlones.